The first place Atlanta Braves (48-34) come to town, to face the third place Phillies (42-38) for a 3-game series. Atlanta currently leads Philadelphia by 5 games in the National League East standings. With a steady stream of injuries this year, the Phillies haven't been able to maintain their head lock on the top spot in the division. The team is aware that this head-to-head meeting with the division leader is their chance to bounce back. 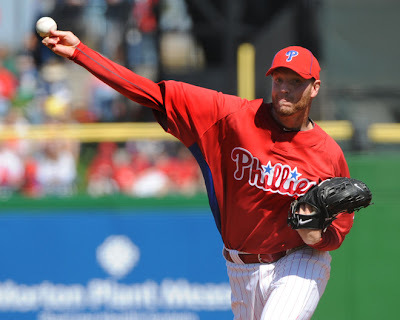 The Phillies will try to take a chunk out of that deficit in the standings by sending their ace, all-star Roy Halladay to the mound in game one. The Braves will counter with Derek Lowe, who is 1-2 with a 6.00 ERA in three starts against the Phillies in 3 outings this year. Read ahead for details in the pitching match ups and loads more information, as the division rivals meet in this crucial series. Monday, 7:05pm. Derek Lowe (9-6, 4.53 ERA) vs. Roy Halladay (9-7, 2.42 ERA). Lowe has a 4.75 ERA and a 1-2 record over his last 5 starts. In his career against the Phillies, Lowe has posted a 7-3 record and a 3.26 ERA in 17 games. Shane Victorino is 2-for-20 (.100 avg) against Lowe in his career. The Phillies have scored just 12 total runs in Halladay's 7 losses. In 3 career games against Atlanta, Halladay is 2-0 with a 0.46 ERA. In his last 5 home starts, Halladay is 1-4 with a 3.34 ERA. Nate McLouth, Martin Prado, Omar Infante and Yunel Escobar are a combined 0-for-24 against Halladay in their careers. Tuesday, 7:05pm. Jair Jurrjens (1-3, 5.59 ERA) vs. Cole Hamels (6-7, 4.07 ERA). In 8 career starts against the Phils, Jurrjens has posted a 3-3 record with a 2.25 ERA and a .199 batting average against. In 3 road starts this season, Jurrjens is 0-3 with an 11.45 ERA. Wilson Valdez is 4-for-4 against the right-handed Jurrjens in his career. In 16 career starts against the Braves, Hamels is 8-5 with a 4.28 ERA. In his last 7 starts, Hamels is 1-5 with a 4.28 ERA. Hamels is 3-3 with a 3.59 ERA in 8 starts at Citizens Bank Park this season. Brian McCann is 11-for-33 (.333 avg) with a homer and 10 RBI against Hamels in his career. Wednesday, 7:05 pm. Kris Medlen (5-1, 3.01 ERA) vs. Jamie Moyer (9-7, 4.13 ERA). In 12 road games this season, Medlen is 3-1 with a 3.40 ERA. In 8 career games against Philadelphia, Medlen has no decisions, a 5.11 ERA and a .380 batting average against. Injured Phillies Carlos Ruiz, Chase Utley and Placido Polanco are a combined 8-for-10 (.800 avg) against Medlen. In 18 career games against the Braves, Moyer is 6-9 with a 4.76 ERA. Excluding Moyer's awful 1 inning/9 earned run outing against Boston on June 11th, he has posted a 2.74 ERA over his last 9 starts. In 7 starts at Citizens Bank Park this year, Moyer is 5-2 with a 2.94 ERA. Troy Glaus is 21-for-60 (.350 avg) with 5 homers against Moyer. Yunel Escobar is a .214 career hitter in 46 career games against the Phillies. Escobar is 6-for-42 (.143 avg) against the Phillies' 3 scheduled starting pitchers in this series. In 37 career games against the Phillies, controversial all-star Omar Infante is a .228 hitter with 3 homeruns. All 3 of those homers have come at Citizens Bank Park. Braves' closer Billy Wagner has a 6-4 record with 35 saves, 5 blown saves and a 1.97 ERA in 81 career games at Citizens Bank Park. Shane Victorino has a .261 batting average, batting first in the batting order this season. Victorino's average is .235 in all other places of the Phils' lineup. Philies infielder Wilson Valdez is 8-for-21 (.381 avg) with 2 homeruns and 6 RBI in his last 6 games played. In 19 home games this season, Valdez is batting .188, compared to his .300 batting average away from Citizens Bank Park. In 37 games at Citizens Bank Park this season, Jayson Werth is batting .306 with a 1.033 OPS. Of Werth's 13 homeruns this season, he has hit 10 of them in Philadelphia.